We may have a love-hate relationship with technology at times. We love how it made our lives convenient and colorful and virtually erased the word boredom in our dictionary. You’ll never run out of things to do with a smartphone in hand. You don’t even have to go anywhere outside of your room but still stay up-to-day on all the latest happenings and even be able to communicate to family and friends who are thousands of miles away from us. Yet, that is indeed the power of technological innovations. It is simply mind-boggling. Yet no matter how awesome it is, it has its drawbacks and probably just as many as its niceties. First of all, they cost money – a whole lot of it. They are high-maintenance as well. Upkeep and repair costs can seriously endanger your wallet. Electricity consumption likewise rises not to mention all of the dangers it poses to the environment. People get lazier too. We, as a whole, tend to rely on these tech contrivances to do things for us, hence we forget many important life skills that the young ones aren’t familiar with as well. However, there is one group that also greatly benefited from the rise of technology – those with special needs. Back in the days, communication, (medical) care, transportation, etc. of the differently abled are almost next to impossible. If they are doable, they may come at a high expense. Fortunately, technology has solved many of these problems for them and made their lives just as comfortable and safe as the rest of the population who are perfectly normal and with no physical limitations. It has allowed them to communicate to the world alongside the rest of us and made way for safe travels and differently abled-friendly establishments both private and public. They are no longer highly dependent on other people to do things for them because they can now do it for themselves with little to no help at all since technology is always there to lend a helping hand. Many of them can even hold jobs to support their needs and finally become a part of the productive workforce. We all love technology. Who doesn’t, right? You can spend hours loon in your smartphone watching one video after the other without a care in the world or what time it is already. However, price remains to be an issue even if competition is healthy in the market especially for highly-specialized gadgets that the differently abled needs to help them enjoy normal lives. That persists to be a major challenge for these people and will probably be until the next few years. 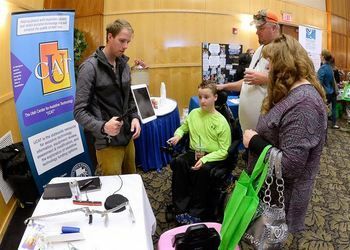 The industry is still budding and far from perfect but that means there are also lots of room for improvement and other areas the expert can look into and build innovative devices that will address perennial needs of those with handicaps. Aside from providing better and a more widespread access to learning by improving transportation for those with special needs, they also have the option not to leave their homes and take classes in front of their computers instead. With that, they can enroll in different modules or courses without the added hassle of everyday travel or commute. Online learning platforms even cater to different needs and the technology is still improving as of this time. Whatever your limitation is, experts continue to find solutions to meeting your needs and providing you with an opportunity to be of equal footing to those with perfectly-abled bodies by harnessing the technology they need to break out of their limitations and make the most of their remaining senses to function as an individual. Whether it is in education or in the global workforce, those with special needs find more and more opportunities to develop to their fullest potential and not be hindered by whatever physical limitation they have.